Why would the Pittsburgh school board invite an organization into our schools that could potentially harm students and the district itself? I can’t answer that question, but it appears that is what they are about to do by signing a deal with Teach for America. While TFA may be a good thing for these young people who wish to experience “the real world” for two years before moving onto their “real careers,” the program is not necessarily helping students. In fact, it may be hurting them. And there are some very big concerns about the damage TFA is doing to public education more generally. The Pittsburgh Public School board opened the door to TFA when it hired the outside consultants Bellwether and FSG at the beginning of this year to help close the district’s looming budget gap: their winning proposal promised to help the district recruit “high quality teachers” by “building a strong pipeline of talent through partnerships with local universities as well as with major alternative certification providers such as New Leaders, Teach for America, and the Urban Teacher Residency.” [Bellwether and FSG proposal, p. 12] At the time, the district’s director of strategic initiatives in charge of the Bellwether/FSG contract was Cate Reed, a TFA alumna who has since left to do development work for, yes, Teach for America. [Post-Gazette, 8-21-13] Meanwhile, TFA has set up shop in Pittsburgh and is now hiring a Founding Executive Director to plan their expansion into the city by next fall. This sounds good. However, in a technical review of that work, Dr. Vasquez Heilig points out that this number requires context, noting that “class size reduction has 286% more impact than TFA.” What’s more, a recent analysis demonstrates that early childhood education has “1214% more impact than the TFA effect reported by Mathematica.” [Cloaking Inequality, 10-21-13] The bottom line? TFA doesn’t look like a silver bullet for our students and other initiatives such as class size reduction and early childhood education have an exponentially larger impact on student learning. 2. Will TFA hurt our students? TFA corps members sign up for a two-year commitment and then most go on to other careers, contributing to the churn in the lives of students, many of whom are already facing great instabilities. Education historian Diane Ravitch calls TFA, “Teach for Awhile.” About 20-30% of TFA members stay in the classroom 3-5 years, and only 5% are still teaching in their initial placement by the seventh year. [Cloaking Inequality, 10-21-13] Many TFA alumni are now speaking out about their experiences working with some of our neediest students. With only five weeks of training, they say they were ill-prepared to work with troubled kids, could do little more than “teach to the test,” and worry that they really were harming children. [See for example Washington Post 2-28-13; John Bilby; Cloaking Inequality, 9-20-13 and 8-6-13] These are testimonies worth serious attention. 3. Will TFA solve our staffing needs? Pittsburgh is apparently considering a deal with TFA because of a shortage of middle level and high school math and science teachers. The administration claims that TFA will help them get young people of color to fill these positions – a worthy goal, but at the last board meeting, TFA representatives said they could not guarantee that this would happen. If we truly have a staffing problem, why aren’t we working with local universities to place their recent graduates and “grow our own” regional talent? What happened to previous new-teacher programs in the district? I’ve also heard that our hiring cycle is quite late in the year, putting us at a disadvantage when it comes to making competitive offers: why don’t we address this simple calendar issue? I find it hard to believe that with at least seven teaching-degree-granting colleges and universities in Southwest PA, Pittsburgh can’t figure out a way to fill its ranks with highly qualified, trained teachers who want to make teaching their career, and perhaps even stay in their hometown. 5. What will TFA cost us? TFA operates like a temp agency, tacking on a finder’s fee for its recruits. It charges districts $3,000 to $5,000 per instructor per year – and that’s on top of the regular entry level teacher’s salary each TFA recruit receives from the district. How is that saving us money in the middle of this budget deficit crisis that has already forced the district to furlough hundreds of our kids’ teachers? To makes matters worse, TFA seeks out grants from states where it is doing business (it has a plan to increase state collections to $350 million in 2015). That is more of our taxpayer money that ought to be going towards equitable funding of our public schools. And it’s clear that TFA wants to tap into other local resources: its current job ad says that Pittsburgh’s Founding Executive Director will “Grow a sustainable, diversified local funding base that will include gifts from individuals, corporations, and foundations; district and local public funding; and possibly an annual benefit dinner.” [Linked In, posted October 2013] Our city is not a gravy train and those valuable resources ought to be going to support students in public schools, not TFA. Make no mistake, TFA is a huge organization with a $100 million endowment and annual revenues close to $300 million. [All figures from Politico, October 2013] If TFA really wants to help Pittsburgh students, it could help us with our $46 million budget gap. In Pittsburgh, TFA wants its new Executive Director to “Develop and evolve a strategy for maintaining and growing our public support, from district, local, and state sources,” and to “Establish relationships with school districts and charter management organizations to place corps members with an eye toward maximizing scale and sustainability.” [Linked In, posted October 2013] No doubt about it: they’re planning to stay. And grow. In a big way. Is this the organization that we want to invite in Pittsburgh’s front door? I’m not convinced from the review of the evidence that Teach for America will help our students. And I am deeply concerned that it may directly harm students, while costing us resources we don’t have, and failing to address our actual staffing needs. Here’s one last question: Can we show TFA the back door and say, no thanks? 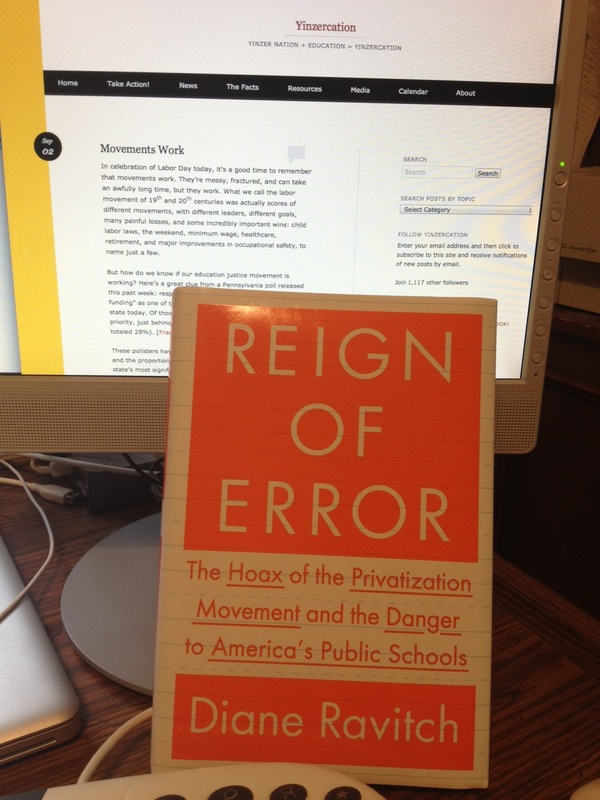 On Monday, Yinzers were the first in the country to see Diane Ravitch’s new book, The Reign of Error: The Hoax of the Privatization Movement and the Danger to America’s Public Schools. Released nationally on Tuesday, the book is already #1 in public policy and has moved up to #104 on the Amazon top-sellers list. Pittsburgh helped to launch a crucial conversation – and what a launch! An audience of nearly 1,000 people packed into Temple Sinai to hear Dr. Ravitch, an education historian, former U.S. Assistant Secretary of Education, and widely acclaimed expert on public schools. The event was part-rally and part-lecture, with stand out performances by the Pittsburgh Obama steel drum band, the Pittsburgh Dilworth drummers, and the Pittsburgh Westinghouse Bulldogs high-stepping marching band. And because we are an education justice movement – and movements must make music together – we stood side by side to sing the anthem We Shall Not Be Moved. In her talk, and backed up by pages of data in her book, Dr. Ravitch offered abundant evidence that the reformers’ “solutions” for public schools are actually hurting our children. From cyber charter schools, to parent trigger laws, to vouchers, mass school closures, merit-pay, high-stakes-testing, and mis-used teacher evaluation systems, she demonstrated the perverse consequences of these efforts. Most crucially, she explained why we must pay attention to racial segregation and poverty – and how privatization does nothing to solve the larger issues that are truly affecting our students and schools. Dr. Ravitch offered no silver bullets. But she did offer plenty of evidence-based solutions. She advocates for pre-natal care for all expectant mothers; universal, quality early childhood education; smaller class sizes; a re-thinking of charter school laws so that public schools and charter schools can truly collaborate; wrap-around services such as healthcare and social services in the schools; tests designed by teachers to measure student learning and the elimination of most high-stakes-testing; efforts to strengthen the teaching profession; and the protection of local, democratic control of public schools. Several student leaders from the Westinghouse Bulldogs high-stepping marching band joined Dr. Ravitch on stage to explain what has happened to arts education, music, and band at their high school. Despite the proud Westinghouse legacy that includes many of this country’s jazz greats (think Billy Strayhorn, Al Aaron, Mary Lou Williams and a host of others), the ragtag band has almost no instruments, hasn’t had new uniforms in more than a dozen years, and can’t even afford to buy drumsticks. Yet the students are passionate about holding their band together. In response to their statement, the Rev. David Thornton issued a full-throttle call-to-action to the audience and our collection raised over $1,600 to support the Bulldogs. That is why it’s so important that our community is standing up together now for public schools. On Monday, Dr. Ravitch said she believes “the tide is turning” against corporate-style reforms and that parents, in particular, are the “sleeping giant” that will be key to change. Here in Yinzer Nation, that giant is waking up and joining forces with students, teachers, and other community members. Witness the new coalition of community organizations, faith-based groups, and labor that hosted the event. Called Great Public Schools (GPS) Pittsburgh, it consists of: Action United, One Pittsburgh, PA Interfaith Impact Network, Pittsburgh Federation of Teachers, SEIU, and Yinzercation. In addition to these groups, we had so many generous co-sponsors – including an impressive collaboration of seven of our region’s colleges and universities – that we were able to keep the evening completely free and open to the public. The co-sponsors were: Carlow University School of Education, Chatham University Department of Education, Duquesne University School of Education, First Unitarian Church Social Justice Endowment, PA State Education Association, Robert Morris University School of Education & Social Sciences, Slippery Rock University College of Education, Temple Sinai, University of Pittsburgh School of Education, and Westminster College Education Department. Children participated in activities provided by volunteers from the Carnegie Library of Pittsburgh and Carnegie Mellon University’s HearMe project. Mystery Lovers Bookshop was on hand with special permission from the publisher to sell early copies of the new book. They sold out in a matter of minutes and audience members waited patiently in a long line at the end of the evening to meet Dr. Ravitch and get their books signed. The crowd of 1,000 included many elected officials and policy makers who will help to shape the future of our schools. They included the Democratic nominee for Mayor of Pittsburgh, Bill Peduto, current and incoming members of Pittsburgh City Council and the school board, superintendent of Pittsburgh Public Schools Dr. Linda Lane, Pennsylvania gubernatorial candidate John Hanger, and school board members and superintendents from school districts as far flung as Franklin Regional, Wilmington Area, South Butler County, Carlynton, and Chartiers Valley. In short, this was a fantastic Yinzer-style launch to Diane Ravitch’s national book tour. And she has left Yinzer Nation with all the evidence we need to combat the de-funding and privatization of our schools. Help us keep this grassroots, education justice movement growing in Southwest PA: please be sure to subscribe to this blog, like us on Facebook, and follow us on Twitter so we can stay connected! Diane Ravitch. Monday. Be There! If you do just one thing for public education this month, come hear Diane Ravitch on Monday evening – and bring a friend. Seriously. This is a huge event for our education justice movement in Southwest PA and a crucial opportunity to be a part of the conversation about the future of our schools. The event will be at Temple Sinai in Squirrel Hill (5505 Forbes Avenue / 15217). Doors open at 5PM. The lecture begins at 6PM. Do you have friends wondering about school closures? The massive budget cuts? Increasing class sizes and high-stakes-testing? Have them spend just one hour with Diane Ravitch to learn why there is a better way forward for our kids and our schools. We are honored to have Dr. Ravitch here for the premiere of her book, which will not be released nationally until the following day. Pittsburghers will be the first in the country to see this incredibly important new work! (I can say that with confidence because the publisher sent advance copies of the book to education bloggers and I’ve already had the pleasure of reading it.) I am pleased that Mystery Lovers Bookshop will be on hand with copies and that Dr. Ravitch will stay after her talk to sign books. We can seat 1,000 people and it will be on a first come, first seated basis. Many local and state legislators will be joining us as well as school board members and district administrators. Dr. Ravitch will host a Q&A following her talk, so this promises to be an important community conversation with many of the region’s stakeholders and decision makers in attendance. We are also expecting lots of media coverage, including some possible national attention. Be sure to come early to get your seat! For your enjoyment during the 5 o’clock hour, we will have some terrific student performances. Come hear the Pittsburgh Obama Steel Drum band and the Pittsburgh Dilworth Drummers raise the roof! Children’s activities will be provided by the Carnegie Library of Pittsburgh and Carnegie Mellon University’s HearMe project. 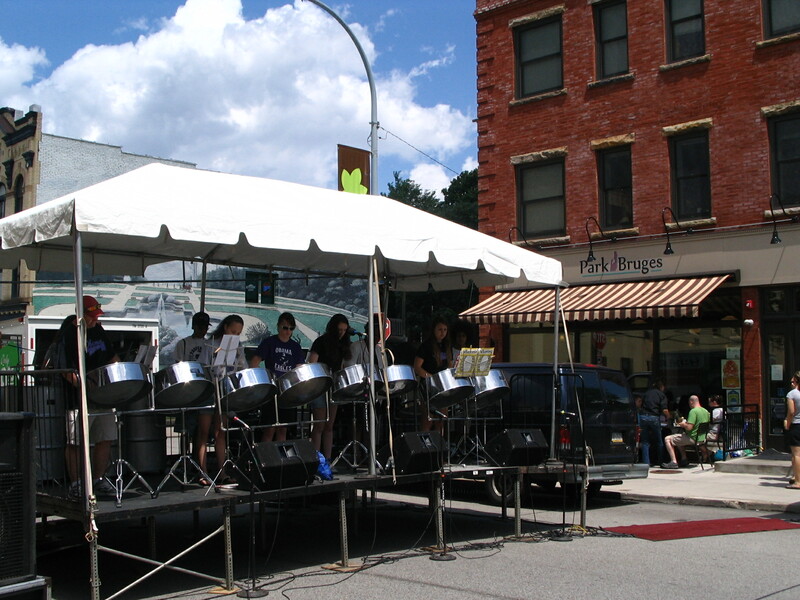 Pittsburgh Obama Steel Drums play this summer for a neighborhood street festival. 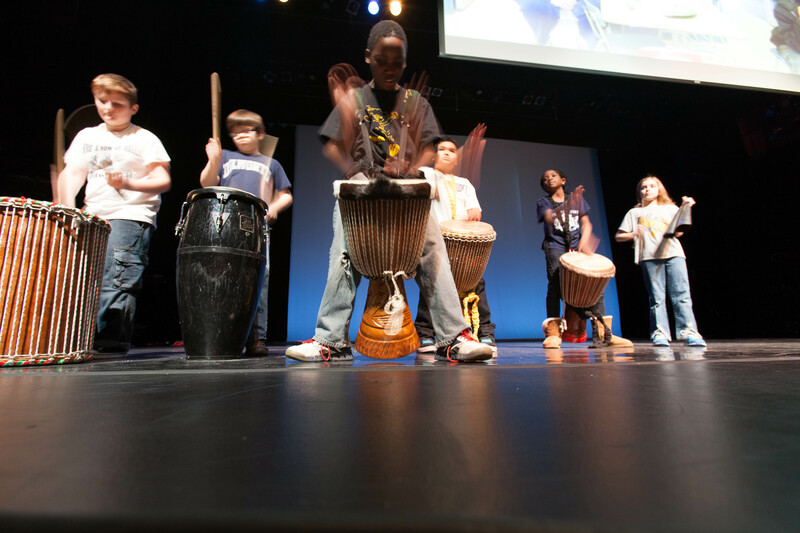 Pittsburgh Dilworth Drummers play for our Rally for Public Education back in February. This event is being hosted by our new coalition, Great Public Schools (GPS) Pittsburgh: Action United, One Pittsburgh, PA Interfaith Impact Network, Pittsburgh Federation of Teachers, SEIU, and Yinzercation. Thanks to our co-sponsors, we are able to keep the lecture free and open to the public. Much appreciation to: Carlow Univ. School of Education, Chatham Univ. Department of Education, Duquesne Univ. School of Education, First Unitarian Church Social Justice Endowment, PA State Education Association, Robert Morris Univ. School of Education & Social Sciences, Slippery Rock Univ. College of Education, Temple Sinai, Univ. of Pittsburgh School of Education, and Westminster College Education Department. If you haven’t yet RSVPed, please head over to our Facebook event page where you can let us know you are coming. You can also invite your friends and help spread the word. See you Monday! Move over Adequate Yearly Progress (AYP). Time to make room for the School Performance Profile (SPP). Pennsylvania has just been granted its waiver to the federal No Child Left Behind (NCLB) Act, which had required that all students in the country be proficient in reading and math by next year. But don’t start celebrating just yet. And that’s exactly the problem. This new SPP system will label schools without providing any real help for struggling students. If a school receives federal Title I money (based on its proportion of poor students), it will be labeled “priority,” “focus,” or “reward.” All other schools will get a profile score. It’s not clear if that score will be a number or letter grade (A – F), which is very trendy right now among corporate-style-reformers who support vouchers, charter-expansion, school closure, and other privatization efforts. Either way, the bottom line is these rating systems do not appear to work and are definitely subject to cheating. That is exactly what happens with high-stakes-testing and its application to school grading. Earlier this month Florida’s state superintendent, Tony Bennett, was forced to resign after reporters discovered that he had changed accountability measures to lift the grades of several schools back in Indiana when he was the elected public school leader of that state. In one case, he helped change a C to an A grade for a charter school run by and named after one of his campaign donors. [Politico, 8-1-13] See the distortion and corruption of Campbell’s Law? It appears that Pennsylvania may sidestep this issue by using two separate systems here: applying the SPP score to all schools, and the priority-focus-reward labels only to Title I schools. But without actual assistance for struggling students and districts, all of these scores and labels are meaningless. In fact, they are harmful, since they tend to have major consequences – from stigmatizing schools (who wants to send their kids to an “F-rated” school? ), to further narrowing the curriculum (since the high-stakes-tests cover only the basics, subjects like art, music, and world languages get fewer and fewer resources), to the threat of closure. Under the new SPP labeling system, Gov. Corbett’s administration promises interventions, “focusing on having principals who are strong leaders; ensuring effective teachers; providing additional time for student learning and teacher collaboration; and strengthening instructional programs.” The state will also “provide academic recovery liaisons to help priority schools.” [Post-Gazette, 8-21-13] Hello, what? Where is the money to hire back our teachers, school counselors, nurses, and librarians? How about some funding for our after-school tutoring programs we had to cut? And early childhood education? Maybe SPP should stand for Stupid Public Policy. If we are serious about offering interventions and supports to struggling schools, we have to be talking about wrap-around services that address trenchant disparities: we need community healthcare in the buildings, childcare, adult job and literacy training, family crisis services. We need to make sure communities have a good public school to send their children to and that we aren’t creating school deserts. We need authentic parent engagement. And we need to make schools enriching, welcoming places that students want to be in with full art programs and a wide range of activities. I worry that SPP will just replace AYP: with more high-stakes-testing, more labeling-and-punishing schools, more blaming teachers, and still no results for our kids. It’s been a rough couple of weeks for our public schools, and they’re not even in session. In the heat of the summer Pittsburgh schools – and our teachers – have come under attack. First, in an appalling public statement on the residency requirement for city police officers, the Fraternal Order of Police president, Sgt. Mike LaPorte, called our schools “bloodbaths” and suggested that Pittsburgh officers want to flee to the suburbs for their children’s education. [Post-Gazette, 7-8-13] It seems to me that Sgt. LaPorte has not actually spent much time around our city schools lately. His comment insults Pittsburgh families, the overwhelming majority of whom (80%) send their children to our public schools. Do our schools still have problems? Absolutely. But bloodbaths? Absolutely not. Sgt. LaPorte should be encouraging his officers to be a part of the solution building Pittsburgh’s future, rather than taking pot-shots at our public schools in an attempt to justify his policy position on residency requirements. It’s not only factually wrong, but it strikes me as unethical, and entirely unproductive, for one of our community leaders and public servants to bash public education. Strong schools make strong communities – and isn’t that what our police force is working for, too? In a response to LaPorte’s comment, Pittsburgh Federation of Teachers president Nina Esposito-Visgitis wrote an op-ed piece explaining the many ways in which our public schools are anything but a bloodbath. For example: “More than 70 percent of Pittsburgh’s teachers hold advanced graduate degrees.” That’s far more than the national average of 52 percent for public school teachers and 38 percent for private- and charter-school teachers. [Post-Gazette, 7-24-13] Did you know that two Pittsburgh public high schools (Allderdice and CAPA) were rated in the top 20 Pennsylvania high schools this year and ranked among the best in the country by U.S. News and World Report? More troubling, though perhaps not surprising, was Dr. Haulk’s suggestion that we “redirect some of the vast sums of taxpayer dollars and Promise money to real education reform.” By which he means, “create scholarships for elementary and secondary students to allow them to opt out of Pittsburgh schools and enroll in private or parochial schools.” This is, of course, the voucher system that Gov. Corbett has tried to impose since coming into office, and which remains wildly unpopular with voters (not to mention unconstitutional since we have that tricky little clause in the Pennsylvania constitution forbidding taxpayer money from being used for religious schools). The bottom line that Dr. Haulk seems to want to ignore is that voucher and tax credit schemes don’t actually work for students. Most of the money goes to families who are already enrolled in private schools – in other words, it does not “rescue” kids from “bad” schools. There is no evidence that these programs improve student performance. (And our existing tax credit programs were created with no accountability so we have no way of knowing how students might be doing in them.) What vouchers and tax credits do succeed in doing is draining desperately needed revenues from the state right at the time our public schools are missing $2.4 billion in budget cuts. Private schools do not, cannot, and will not serve all our kids. Mr. Ghubril stated it beautifully: while acknowledging that our “safety net [of public education] has many holes in it,” he said that, “until [Haulk] offers a better safety net that is required to educate all children, I will spend the rest of my days, with a needle and thread, sewing as many of the holes as possible.” And then he invited “all good-hearted people to pick up their needles and sew.” Amen to that. Really? Less credentialed, meaning less qualified, teachers are going to help our students? How is that supposed to happen? Mr. Kelly apparently thinks that our teachers have too many master’s degrees. Or maybe too many Ph.D.’s? Or is too much experience the problem? And he says our public schools stink. Wow. Maybe he needs to go on a tour with Dr. Haulk and Sgt. LaPorte. I’m sure we could arrange one. Frankly, I’m getting sick of the tired old line that teachers only care about themselves and their contracts. As the Facebook meme going around this summer says: “I went into teaching for the money, said no teacher ever.” Improving public schools does not happen by vilifying our public school teachers. Now, if the nastiness from Kelly, Haulk, and LaPorte weren’t enough, this week we learned that Pittsburgh has just approved 36 new furloughs – on top of the 280 last year – and returned 32 educators to furlough status (these were staff who had been laid off and then brought back for temporary positions). [Post-Gazette, 7-25-13] That means our kids will be missing 68 educators next month when they return to their schools. All of those furloughed are teachers and professionals such as early intervention specialists working in schools (not central administration). The majority are paraprofessionals who work right in the classroom with students, so this will have a direct and immediate negative impact on children. And some of the kids who will be hurt the most are the very ones we should be investing the most in: because the district is losing over $2 million due to federal sequestration cuts, it is closing six early childhood classrooms. Yes six entire pre-K classrooms. Budget cuts. Furloughs. Closed classrooms. Name calling. Attacks on teachers. Maybe Sgt. LaPorte was right – there is a bloodbath in public education. Just not the kind he’s thinking about. And it’s going to be full of the blood of our children unless we collectively stand up and fight back. It must be all the spring rain – new corporate-style reform groups are popping up like weeds. The latest one just appeared in Pittsburgh on Tuesday with an Op Ed piece in the Post-Gazette promoting teacher evaluation. [Post-Gazette, 5-21-13] Called PennCAN, this group is an off-shoot of the Connecticut based ConnCAN, which has started a national effort known as 50CAN. So who are these “cans” and what are they saying? ConnCAN was founded by investment manager Jonathan Sackler, who is also on the board of an oil and gas production company, a real estate investment company, and several pharmaceutical companies. He is also a trustee for Achievement First, which operates charter schools in four cities, as well as on the board of New Schools Venture Fund, which raises money to “invest” in “education entrepreneurs,” with a long history of funding charter schools and charter management organizations (CMOs). Last fall, Mr. Sackler wrote a check for $50,000 to a superPAC (it’s largest donation) that is trying to eliminate the local, democratically elected school board in Bridgeport, Connecticut and replace it with a politically appointed board under the supervision of a corporate-reform mayor. Sackler’s ConnCAN has spawned a national effort, 50CAN, which is working to do the same thing in other states: for instance, in Minnesota, they supported the campaign of a pro-charter, Teach for America alumnus. (Unfortunately, Teach for America seems to be in the corporate-reform camp: a topic for a future blog post, but for starters, see educator and TFA alumnus Gary Rubinstein’s analysis of TFA’s biggest claims.) The chairman of 50CAN’s board is Mathew Kramer, the President of Teach for America, which also put money into that Minnesota race. [DianeRavitch 2-2-13] Other 50CAN board members include the presidents of two charter school chain operators and a representative from DFER (Democrats for Education Reform). PennCAN’s opening salvo here in Pittsburgh focused on teacher evaluation, an issue that already has some traction given the district’s $40 million Gates Foundation grant for just that. And we’ve seen other local Gates-funded organizations promoting teacher evaluation, including A+Schools and Shepherding the Next Generation, giving the idea additional legs. [See “Big $” and “Astroturf”] Now guess who is funding the national 50CAN? You guessed it: the Gates Foundation. And the Waltons. And Google and Jonathan Sackler, to name a few. So that’s who we’re dealing with. Nice bunch of corporate-style reformers bent on privatization. We’ll look at their claims more closely in a future piece, but for now, we’re calling this can a con.